Read our helpful guide to second hand McLaren 12C. AA Cars works closely with thousands of UK used car dealers to bring you one of the largest selections of McLaren 12C cars on the market. You can also browse McLaren dealers to find a second hand car close to you today. 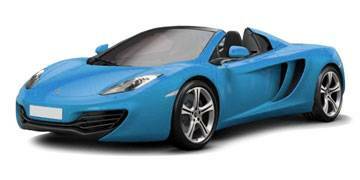 All used McLaren 12C on the AA Cars website come with free 12 months breakdown cover. The McLaren MP4-12C is a furiously powerful, eye-catching supercar which for many is only bettered by the Ferrari 458. That the Ferrari 458 is regarded as the best car currently in production shows just how good the MP4-12C has to be to even be considered in the same league, let alone a genuine contender for its crown. The bare facts are: 0-60mph in 3.1 seconds, a top speed of 205mph, and a 3.8 litre, V8 engine producing 592bhp. It's certainly not an affordable car, nor an everyday one, but there is little to deny the fact that it is a seriously impressive, powerful and beautiful car. The embodiment of the term 'supercar'.